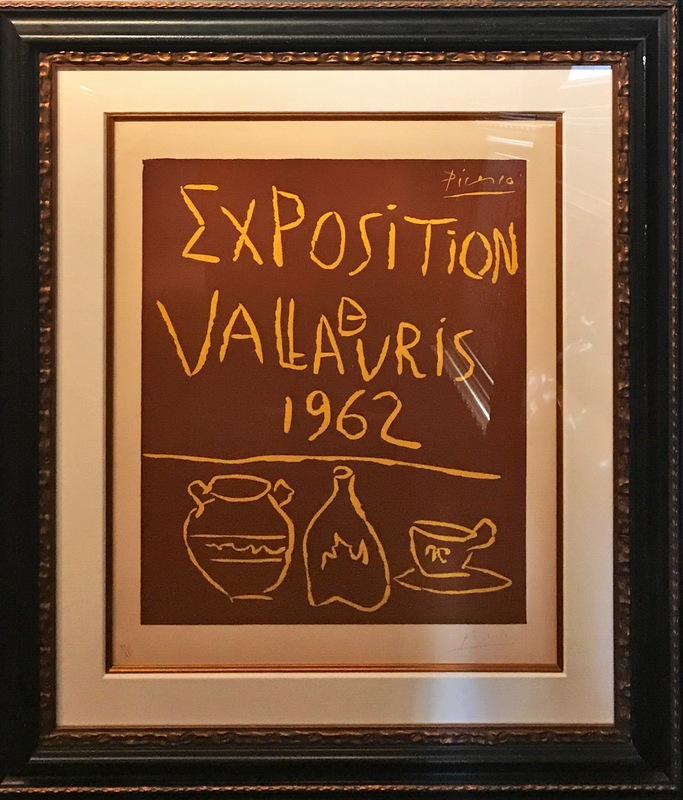 Pablo Picasso | "Exposition Vallauris 1962 " | Linoleum cut | 29.5" X 24.5"
"Color linoleum cut printed in brown and yellow, 1962 Signed and numbered 14/175 in pencil 750x620 mm; 29 ½”x24 ½” Printed by Arnéra, Vallauris. 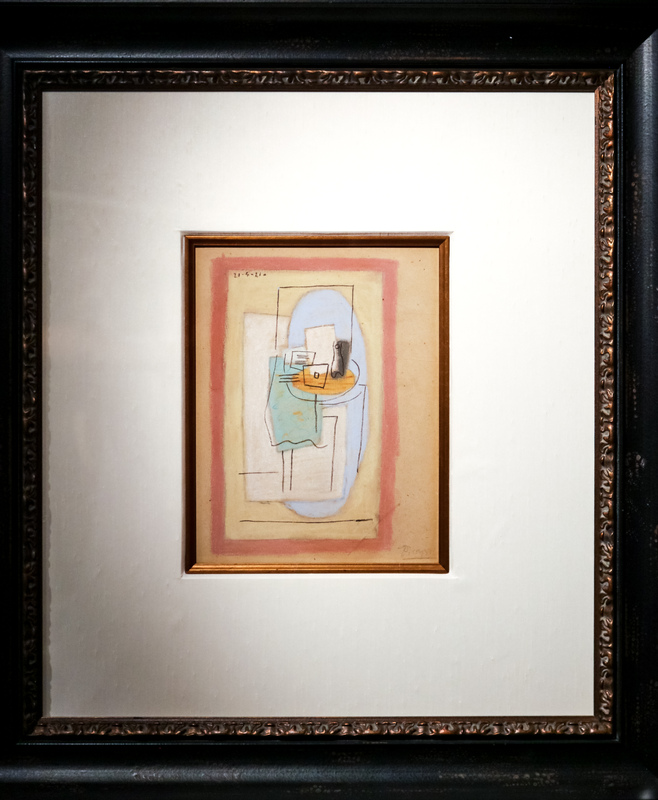 Published by the Association des Potiers de Vallauris Ref: Bloch 1299; Baer 1335"
Pablo Picasso | Nature morte au guéridon | Pastel on paper | 10.87" X 8.5"
"signed 'Picasso' (lower right) and dated '20-4-21-' (upper left) pastel on paper laid down on card 10 7/8 x 8 ½ in. (27.6 x 21.5 cm.) 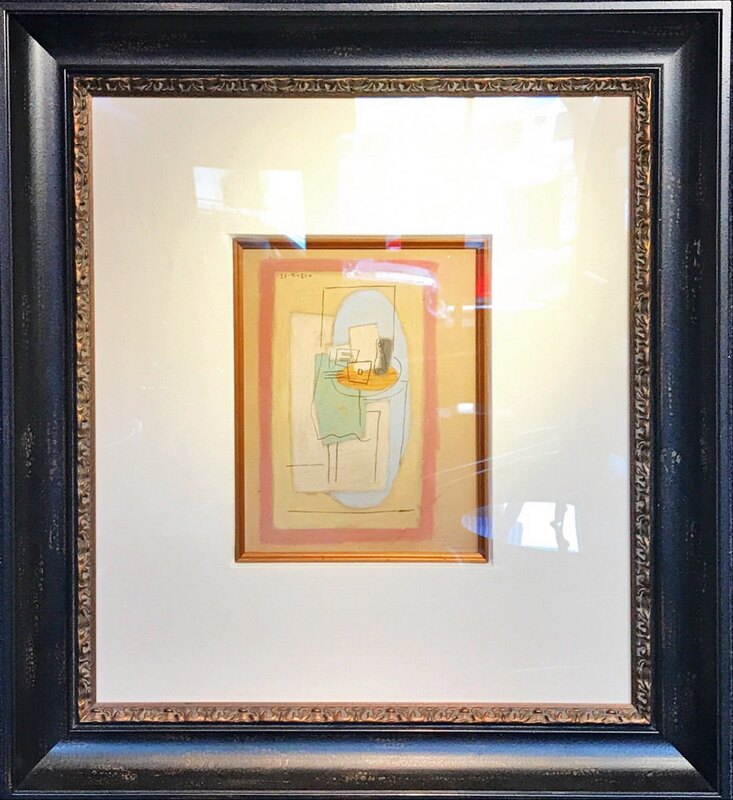 Drawn on 20 April 1921"
Pablo Picasso | Tete D’homme au Maillot Raye | Etching and Aquatint | 42" X 32"
"Etching and aquatint printed in colours, 1964. Signed in pencil and inscribed epreuve d’artist. A proof before the edition of 50. Printed on Auvergne Richard de Bas by Crommelynch, Paris. Published by Louise Leiris, Paris. 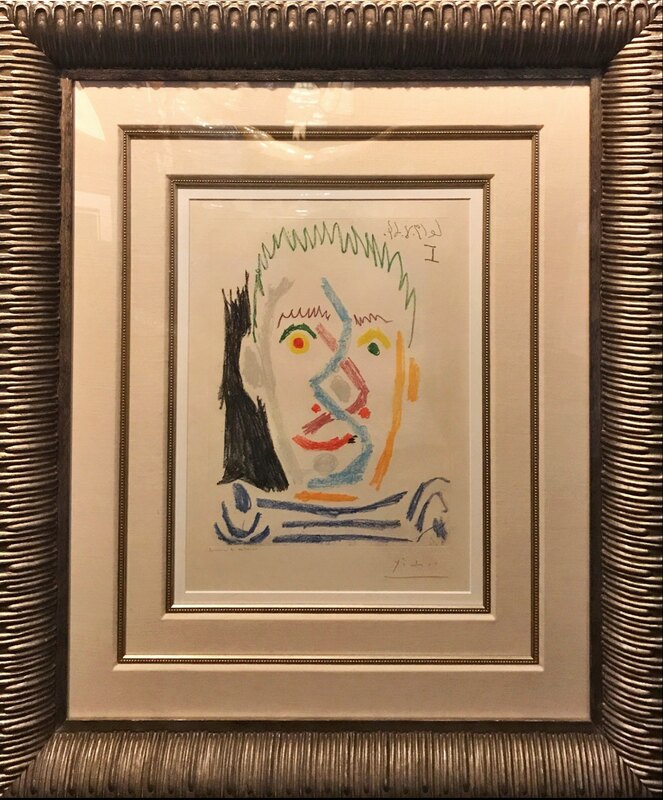 (Bloch 1164; Baer 1164) "
Picasso was a Spanish painter, sculptor, printmaker, ceramicist, stage designer, poet and playwright who spent most of his adult life in France. Regarded as one of the most influential artists of the 20th century, he is known for co-founding the Cubist movement, the invention of constructed sculpture, the co-invention of collage, and for the wide variety of styles that he helped develop and explore. Among his most famous works are the proto-Cubist Les Demoiselles d'Avignon (1907), and Guernica (1937), a dramatic portrayal of the bombing of Guernica by the German and Italian airforces. 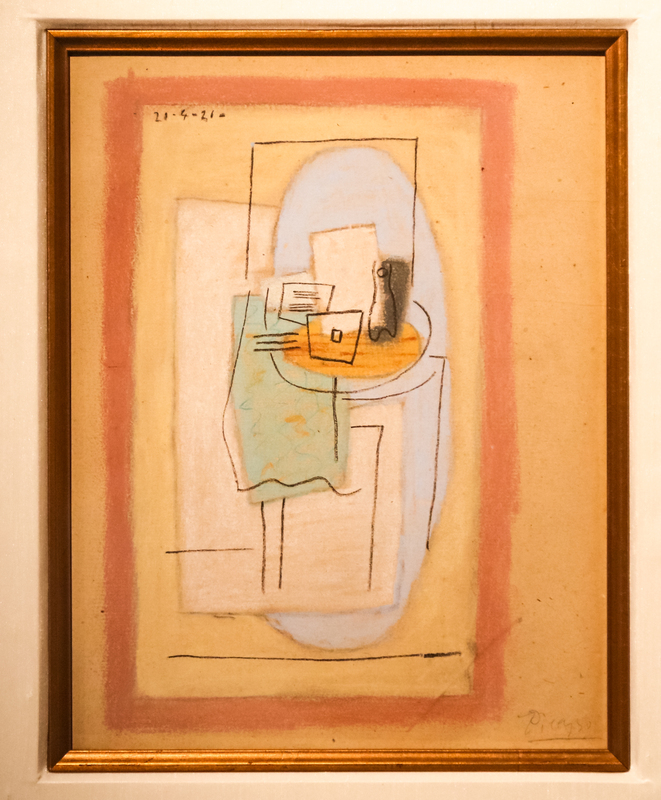 Picasso's work is often categorized into periods. While the names of many of his later periods are debated, the most commonly accepted periods in his work are the Blue Period (1901–1904), the Rose Period (1904–1906), the African-influenced Period (1907–1909), Analytic Cubism (1909–1912), and Synthetic Cubism (1912–1919), also referred to as the Crystal period. Much of Picasso's work of the late 1910s and early 1920s is in a neoclassical style, and his work in the mid-1920s often has characteristics of Surrealism. His later work often combines elements of his earlier styles.